It seems there is no end to England’s miseries. After the humiliation at the hand of Aussies in the Ashes and the following ODI series, now England have lost an ODI match against West Indies which they were almost certain to win. 34-year-old debutant Michael Lumb scored a brilliant century, and it appeared that it would be enough to help England chase the 270 run target set by the West Indians. But as things turned out, England went on to lose the match, and the blame partly goes to their confusion over the “Wide” rule in the format, admitted their captain Stuart Broad, who was leading for the first time in ODIs. 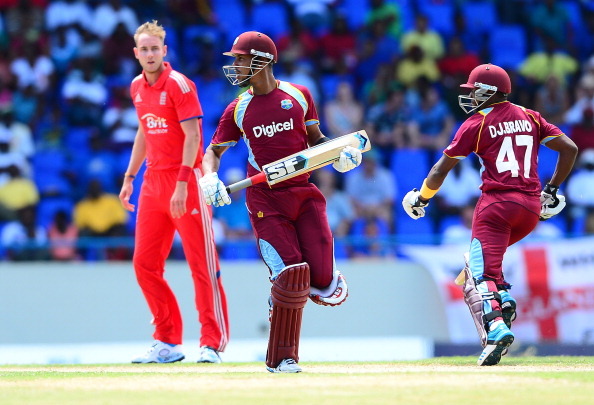 A sensational partnership of 116 runs in the last 10 overs between Dwayne Bravo and Darren Sammy helped them cross the line, while Tim Bresnan, along with captain Broad, required a tutorial on the pitch about the “wide” rule by umpire Marais Erasmus. “It was those last 10 overs with the ball that really hurt us,” Broad said. “If I’m brutally honest, we had quite a strong plan to bowl wide yorkers and get the guys hitting into the big wind, and we got done a little bit by not knowing the rules, I suppose. It was a bit confusing out there but, if the batsman stands outside off-stump, then the line doesn’t move. Bresy got a little bit confused as to where the line actually belonged. Only six overs were bowled by the captain, as he cited a “jarred back” as one of the reasons for his short spell, but he went on to add that it will not keep him out of the 2nd ODI on Sunday, but Eoin Morgan who suffered a bruised knee, might miss the clash on Sunday. Broad said: “We know he is our ace in the World Cup, no doubt about that. It’d be daft of me to sit here and say he’ll be fine for Sunday, because at the end of the day we want him fit for Bangladesh.